, a French mathematician, was born at Paris in 1666. 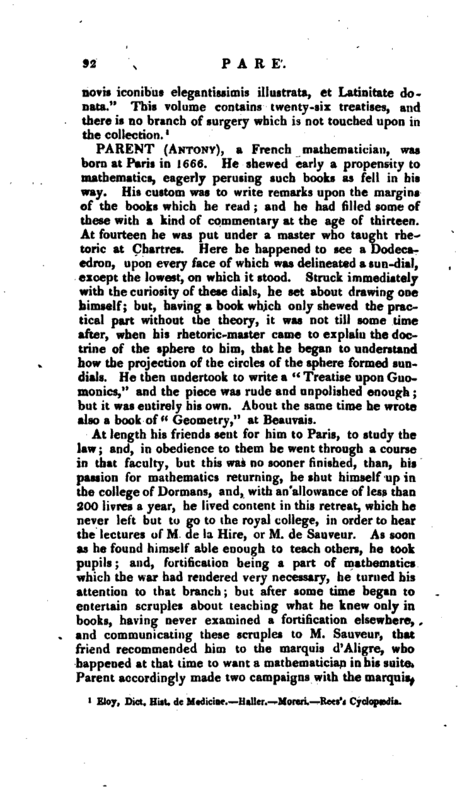 He shewed early a propensity to mathematics, eagerly perusing such books as fell in his way. His custom was to write remarks upon the margins of the books which he read; and he had filled some of these with a kind of commentary at the age of thirteen. At fourteen he was put under a master who taught rhetoric at Chartres. Here he happened to see a Dodecaedron, upon every face of which was delineated a sun-dial, except the lowest, on which it stood. Struck immediately with the curiosity of these dials, he set about drawing one himself; but, having a book which only shewed the practical part without the theory, it was not till some time after, when his rhetoric-master came to explain the doctrine of the sphere to him, that he began to understand how the projection of the circles of the sphere formed sundials. He then undertook to write a “Treatise upon Gnomonics,” anr the piece was rude and unpolished enough; but it was entirely his own. About the same time he wrote also a book of “Geometry,” at Beauvais. At length his friends sent for him to Paris, to study the law; and, in obedience to them he went through a course in that faculty, but this was no sooner finished, than, his passion for mathematics returning, he shut himself up in the college of Dormans, and, with an allowance of less than 200 livres a year, he lived content in this retreat, which he never left but to go to the royal college, in order to hear the lectures of M. de la Hire, or M. de Sauveur. As soon as he found himself able enough to teach others, he took pupils; and, fortification being a part of mathematics which the war had rendered very necessary, he turned his attention to that branch; but after some time began to entertain scruples about teaching what he knew only in books, having never examined a fortification elsewhere, and communicating these scruples to M. Sauveur, that friend recommended him to the marquis d’Aligre, who happened at that time to want a mathematician in his suite. Parent accordingly made two campaigns with the marquis, | and instructed himself thoroughly by viewing fortified places, of which he drew a number of plans, though hq had never received any instruction in that branch. From this time he assiduously cultivated natural philosophy, and the mathematics in all its branches, both speculative and practical; to which he joined anatomy, botany, and chemistry, and never appears to have been satisfied while there was any thing to learn. M. de Billettes being admitted into the academy of sciences at Paris in 1699, with the title of their mechanician, nominated for his eleve or disciple, Parent, who excelled chiefly in that branch. 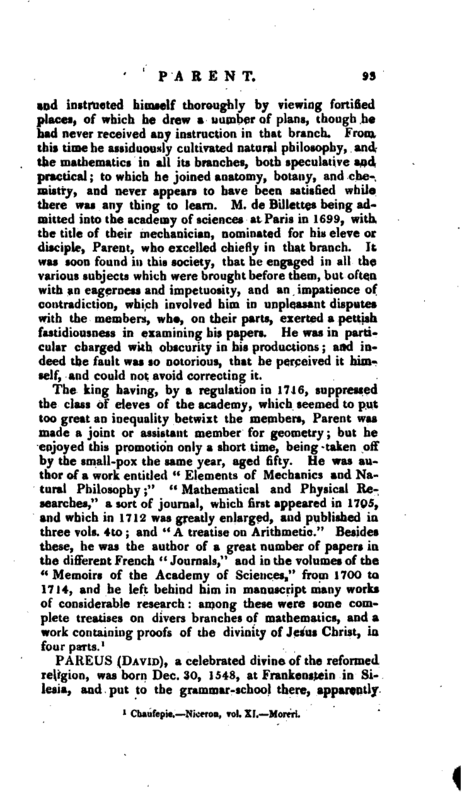 It was soon found in this society, that he engaged in all the various subjects which were brought before them, but often with an eagerness and impetuosity, and an impatience of contradiction, which involved him in unpleasant disputes with the members, who, on their parts, exerted a pettish fastidiousness in examining his papers. He was in particular charged with obscurity in his productions; and indeed the fault was so notorious, that he perceived it himself, and could not avoid correcting it. 1 Chaufepie.—Niceron, vol. XI. —Moreri.